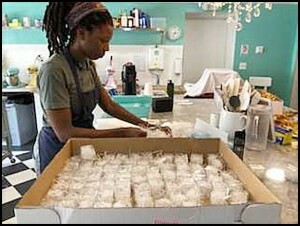 Jamila Kokumo prepares a batch of macrons at Le Detroit Macron Bakery, located on Evaline just west of Jos. Campau. The bakery is celebrating its one-year anniversary this Sunday (Sept. 23). The room inside Le Detroit Macaron is covered with cream-filled eggshells and, on this particular day, a lot of packaging. Ribbons, small miniature boxes just big enough to fill a macaron, and labels brandishing the names of a bride and groom are strewn about a large table behind the clerk counter of this tiny shop on Evaline, just west of Jos. Campau, the retail space where Bon Bon Bon once operated. Two-thirds of the macaron team, Isabelle Elwart and Jamila Kokumo, are preparing large wedding orders — each due the following day. Yet, for all the movement and tight deadlines taking place, there’s not a trace of alarm in the brightly lit bakery with colorful walls that contrast turquoise and jet-black. In fact, over the year Jamila has worked at Le Detroit Macaron she was only nervous one time when over 600 macarons were ordered for the following day. “If you can imagine, 600 shells — that’s probably 1,200 (macarons) we had to make. That was the only order I was biting my fingers about,” explained Jamila. While macarons — not to be confused with their twin baked good, the macaroon — have very simple ingredients, crafting them requires careful technique. “You start with almond flour and confectioners’ sugar and we run that through the food processor,” explained Isabelle Elwart, an 18-year-old Hamtramck resident and baker in the shop. The egg whites are then aged for a day to make the macaron more aesthetically pleasing. “We start it up in the mixer. We do cream of tartar and then add some cane sugar,” Elwart said. After mixing it all together and throwing them in the oven — bravo — you have macaron. In total, three women run the quaint French shop. The previously-mentioned full-time bakers, Jamila and Isabelle, and Patty Corkery, the owner, who also works as a full-time lawyer and COO of the Michigan Credit Union League and, like Jamila, was a graduate of Oakland Community College’s culinary school. Isabelle, who wants to eventually own her own pastry shop, discovered Le Detroit Macaron by reading about it online. Initially, she emailed Patty for a job, but was rejected because they weren’t hiring at the time. Not to be deterred, Isabelle’s dad inspired her to apply again – this time as an intern. Two months later in July, Isabelle’s persistence paid off. “I’d be willing to hire you, for pay not for an internship,” Patty told Isabelle. Patty, for her part, says she never thought she’d venture outside of law. “I never had a plan of baking or opening a bakery,” she said. A few years ago, however, with a lot of untapped energy brewing, she began taking baking classes and flew to Paris, France a few times to indulge herself in the world of French baking. Soon, Patty began looking for places to run a small shop, focusing just on macarons. She decided on Hamtramck because of the small space and cheap sticker price. She also didn’t want to sell too many baked goods because of the upkeep. Instead, Patty and her team are very attentive to how they make, and present, one baked good – macarons. “They got to look good and they really gotta taste good — and that’s all we focus on at our shop,” Patty said. Over the year, they’ve already developed regular customers. “We have one girl, we call her ‘vanilla girl’ because she comes in almost every single week, and gets at least 10 vanilla shells,” Isabelle said. A waitress, ‘vanilla girl’ enjoys spending her money on the pricey baked goods. “She wants me to make a T-shirt that says ‘vanilla girl,’” Patty said. Le Detroit Macaron originally was only open on Saturdays, allowing people to sample their goods. And while the majority of customers buy macarons in the store, the business has continued ramping up tailor-made orders for corporations and weddings. “When we started advertising for wedding orders, we got a new printer that prints images onto the shells,” explained Isabelle. The miniature, edible ink images imprinted onto the macarons was a cute way to advertise for local businesses and celebrate weddings. It was a big hit, and significantly added to their sales. To increase foot traffic into the store, they began offering macaron-baking classes to customers whenever Patty has time to schedule them. “The classes are insane — they sell out in a half hour,” said Patty. If you’re on their email list, you get first dibs. “We’re almost sold out for the rest of the year,” Isabelle added. Isabelle and Jamela will begin teaching the classes for the first time this year. The two women have been an integral part of running the baking shop. “I don’t know what I’d do without them,” Patty said of her two employees. Patty is still trying to figure out some way to celebrate their anniversary on Sept. 23. Le Detroit Macaron is located at 2756 Evaline. For more information call (313) 338 -8006.